You're stuck. Frozen. Can't seem to move forward. What's stopping you? Is it because you're afraid you might fail? Here are some ways to blast through the blockage and get on with it. 1. You have heard the expression, "Anything worth doing is worth doing well." Here's your new motto: "Anything worth doing is worth being willing to do badly." Identify and clarify what you really want in your life, translate what you want into viable options, and then put an action plan together to make it happen. Join us for the next WITI Teleclasses, beginning April 1! More information is on our website. Starting at $99 for WITI Members -- Register now! WITI congratulates Maryfran Johnson, editor-in-chief of Computerworld and the first-ever recipient of the Timothy White Award, a national business journalism award honoring her "goal of placing readers first and maintaining independent, honest, and ethical journalism". In an era where those who take a stand for honesty and integrity are frequently sidelined and punished, it is always encouraging to see someone who continues to act with and promote these values. Especially refreshing is seeing someone rewarded for this dedication. Three cheers for Maryfran Johnson from WITI! Keep up the excellent work! Read the full story of Ms. Johnson's award in Computerworld. Visit WITI's Health Channel for the latest from Mellanie Hills. And see Mellanie at WITI's Southwestern Regional Conference May 7-8, 2004, where she will be speaking on "Designing the Plan for Your Life and Health". Featured Business: Relevant Technologies, Inc. 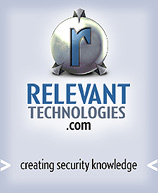 Relevant Technologies is an independent provider of information security research and advisory services. Our award-winning analysts have the ability to identify promising security technologies and foresee how they impact your business, and where they can take you. We help you figure out which technologies are relevant, and which ones are not. We write about security technology so you can understand it. Whether you are trying to understand what product to buy, what technology to use, or which security vendor may be a favorable investment, we unravel complexities that help your organization make well-informed decisions. Our focused research, tutorials, product evaluations and columns are published world-wide. WITI joins WIPP (Women Inpacting Public Policy)! WITI is proud to join WIPP (Women Influencing Public Policy), the nation's largest bi-partisan public policy organization that advocates for, and on behalf of, women business owners and women in business on economic issues. 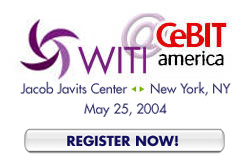 WITI is now a Coalition Partner with WIPP! Your WITI membership will now work to influence the legislative process of our nation, create economic opportunities, and build bridges and alliances for businesswomen and small business organizations. Watch for more information coming soon on our website. Joanne Gordon is currently working on a book, "The Happy 100: Women Who Love Their Work, and Why," to be published by Ballantine Random House in early 2005. As the title suggests, the book will profile 100 working women (from CEOs to scientists, engineers to artists) and explore their jobs and career paths. The book's mission is to help women of all ages craft happy working lives by profiling others who already have. Do you love what you do? Ms. Gordon is still interviewing potential "Happy 100" women, and she invites WITI members to visit her website at www.thehappy100.com. She is especially interested in hearing from women who do not work on the East or West coasts. Women For Hire career expos are great opportunities for women in technology to connect with companies such as Northrop Grumman, Lockheed Martin, Swales Aerospace, Siemans, Nextel Communications, Integic, General Dynamics, among dozens of others. The Women For Hire events will put you in touch with hundreds of technology positions! Visit www.womenforhire.com today for full details and to register. Why Try to Find Customers When You Can Have Them Find You? Founded in 1969, IDX Systems Corporation provides information technology solutions to maximize value in the delivery of healthcare, improve the quality of patient service, enhance medical outcomes, and reduce the costs of care. IDX supports these objectives with a broad range of complementary and functionally rich products installed at 3,300 customer sites. Customers include 138,000 physicians who utilize practice management systems to improve patient care and other workflow processes. IDX offers a full suite of information technology solutions for healthcare organizations of all sizes. The core IDX financial, administrative, and clinical solutions deliver a total information system solution to physician group practices, academic medical centers, hospitals, and integrated delivery networks (IDNs). IDX products include electronic medical records, practice management and business performance systems, acute care systems, imaging, and connectivity services. Search for IDX jobs on WITI4Hire. Network Administrator/Distribution Center, Lowes Companies, Inc.
Lowe's Companies is the second largest home improvement retailer in the U.S. Our tremendous growth has made us one of the nation's fastest-growing Fortune 100 companies. With over 900 stores in 45 states and growing, Lowe's offers tremendous career opportunities. These are just a few of the many reasons that make Lowe's a great place to work. Our caring and forward thinking management team knows that when you succeed, we all succeed. So if you are looking for an outstanding career opportunity without limits, then Experience Life Under Our Roof. Lowe's has exciting opportunities for a Network Administrator based at our Distribution Center in Garysburg, NC. The purpose of this position is to perform systems administration duties for all computer systems and peripheral equipment at Distribution Centers. The incumbents in this position monitor system performance and integrity, provide user support, install system hardware and software, perform preventive maintenance and system backups, and troubleshoot issues brought to their attention. WITI needs a graphic intern to assist the content editor with a variety of images. Acquire experience and expand your portfolio. Experience not necessary, but a familiarity with Photoshop or a comparable graphics program essential. Workload flexible. If you are interested in this unpaid opportunity, please send a note to the editor and include a sample or two of your work. Don't Plan on Having a Man Be Your Retirement Plan!